In front of the largest crowd of the season, the Privateers (9-10, 6-2) fought off Incarnate Word, winless in conference play, for a tight 74-70 victory at Lakefront Arena. New Orleans trailed by as many as 10 in the first half before heading to the locker room down 38-34. They continued to chip away, finally going ahead 50-48 on a Thibodeaux dunk. A Bryson Robinson three-point play extended the lead late to 67-61, and UNO held on for the victory. 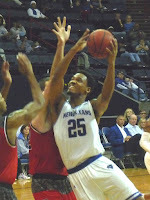 Thibodeaux, not surprisingly, led the Bucs once again in scoring with 21, also adding 8 rebounds and 4 assists. Ezekiel Charles was an important factor with Diontae Champion still injured, starting and adding 15 points, including three triples. Lamont Berzat chipped in 12, including three three-pointers of his own. UNO will finally hit the road again next week for two games, the first at Northwestern State on Wednesday.